We are pleased to inform you that the latest generation of XChange firmware is now available – XChange version 4.2. The new firmware update will enable more remote possibilities for shipping companies, increased system performance and further simplicity, since a number of new features are supported and existing features are improved. XChange 4.2 delivers the updated Universal Remote Access (URA) which is significantly simplified, more secure and more performant. When attempting to connect, End2End channel status information immediately indicates for the user if the vessel is accessible depending on the shore side remote connection. Users no longer require full admin access on their computer to use the function, reducing risk for shipping companies and allowing better control. Additionally, the URA interface is modernised, with a more intuitive, clean structure that is customisable to the user’s needs. Tick boxes enable the user to activate and deactive widgets, whilst the applications they use regularly can be accessed via the URA software connecting them directly to all onboard systems. A new functionality dynamically forwards users to the correct XChange login screen automatically (desktop or mobile version), depending on what device they connect with. 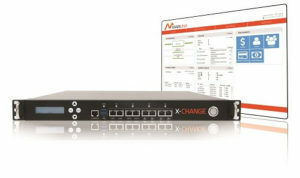 Performance via the new XChange Base and XChange Power hardware is significantly boosted. Answering customers’ demand for full network flexibility, additional dedicated network ports are active with the XChange Power hardware, now enabling up to six physically split, highly secured Local Area or Wide Area Networks. An LCD display on the XChange Power now displays real time status information such as ‘System OK’, or, for example: ‘Updating- don’t reboot’, avoiding harmful disruptions to the updates. XChange 4.2 is prepared to support Marlink’s newest crew communication service: XChange VideoTalk. Scheduled for launch this quarter, XChange VideoTalk provides the ideal tool for high quality, ship-to-shore crew voice and video calling, as well as instant messaging. As well as the new features, XChange 4.2 brings improvements including a fully rebranded user interface, resulting in a more user friendly design and better uniformity across our portals. To simplify fleet-wide roll out additional new features enable users to import back-up files from previous versions and optionally apply new settings to the detailed set of IT parameters, without taking user accounts and local credits into account. In order to advance to XChange 4.2, users have several options either from onboard or remotely. The simplest is to initiate the upgrade by the click of a button in Portal360.